Pisces is a Water Sign, the twelfth and Final Sign of the Zodiac which also rules the twelfth House, the House of the Unconscious. Pisces is ruled by the Planets Jupiter and Neptune, Jupiter being the Roman king of the Gods and Neptune being the God of the Oceans. In the Zodiac Pisces is the opposite of Virgo. Pisces means Fishes in Latin. Pisces seek salvation within themselves, striving for total self - sufficiency and self - reliance. Initially they may be appear very materialistic, but that is only because they don't want to have to worry about material wants on their way to self - knowledge and fulfillment. They wish deeply to do the right thing and may become confused about their true aims and get bewildered and lost in a materialistic jungle. At their truest, they are crystal clear, unselfish, devoted, demanding little, always sacrificing themselves for others. 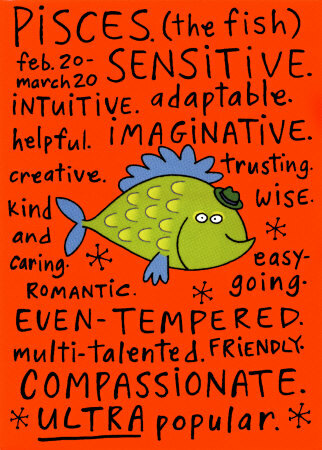 The Key Phrase for Pisces is "I believe". They are emotional and sensitive and can easily be influenced by good and bad, practicality and realism often escapes them. They are also secretive, hard to know, and hardly know themselves. They must learn how to use power wisely, they have vitality, have an urge to rule. They are easygoing, affectionate, submissive and offer no threat or challenge to stronger and more exuberant characters. They are emotional rather than rational, instinctive more than intellectual, and have limited willpower. They tend to withdraw into their own dream world as a retreat from the harsh reality of day - to -day living and the inability to cope with real life. However, they can be remarkably creative in literature, music and art. Astrology Books and Horoscope Guides for Pisces. The constellation resembles two roundish objects, each of which is tied to the same point by a long length of string . Generally the objects have been considered as fish, although since by including fainter stars visible to the naked eye, the strings themselves take on the appearance of stick-figure bodies (with the roundish objects thus becoming heads). Some forms of early Greek mythology viewed it as men bound to a point. It is generally thought that in earlier depictions, only the constellation Piscis Austrinus was considered to be a fish. According to one version in Greek mythology, this constellation represents fish into which Aphrodite and Eros transformed in order to escape the monstrous Typhon. The two fishes are often depicted tied together with a cord, to make sure they do not lose one another. According to another version, since the binding point is below the ecliptic, and thus considered to represent being in the underworld, and that one of the figures (the one on the left) appears to escape, but the other (on the right) seems to head back toward the ecliptic, then, together with Cetus (another constellation in the Zodiac sign of Pisces), this may have formed the basis of the myth of the capture of Cerberus, one of The Twelve Labours of Herakles. 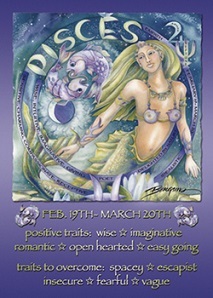 The Western astrological sign Pisces of the tropical zodiac (February 19 - March 20) differs from the astronomical constellation and the Hindu astrological sign of the sidereal zodiac (March 12 - April 18).